Base class for network-layer (incoming/outgoing Interests and Data) tracing of NDN stack. Definition at line 40 of file ndn-l3-tracer.hpp. 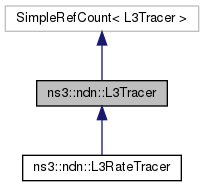 Definition at line 34 of file ndn-l3-tracer.cpp. Definition at line 47 of file ndn-l3-tracer.cpp. 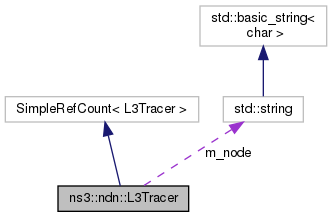 Definition at line 53 of file ndn-l3-tracer.cpp. Definition at line 56 of file ndn-l3-tracer.cpp. References InData(), InInterests(), InNack(), m_nodePtr, OutData(), OutInterests(), OutNack(), SatisfiedInterests(), and TimedOutInterests(). Definition at line 104 of file ndn-l3-tracer.hpp. Definition at line 105 of file ndn-l3-tracer.hpp. Referenced by Connect(), and L3Tracer().